“Nicaragua was an example, from 2007 up until April of a government that reached peace and stability,” said Ortega. July 31 (teleSUR) The president of Nicaragua Daniel Ortega has condemned United States interference in the country, as violent protests have “paralyzed” the nation and disrupted plans for peaceful dialogue. Nicaragua “has always been a target of North American (United States) politics,” and it is, for this reason, several U.S. agencies have “prepared the people” to be against the Sandinista government, the Nicaraguan head of state said in an interview with CNN en Espanol. “Nicaragua is suffering from a powerful media war; I don’t see the international media doing an objective perspective on what is happening in Nicaragua,” he added. On Monday the White House made a statement saying: “President Ortega and Vice President Murillo are ultimately responsible” for the violence in the country. Ortega said several of the death, which has taken place the violent protests sparked in April, have been misclassified. “The official numbers are 195 deaths, which is not something little, it’s terrible. From that number, there are 22 police officers and around 40 Sandinista comrades. They have tortured and murdered police officers and Sandinistas,” Ortega said during the interview. “Nicaragua was an example, from 2007 up until April of a government that reached peace and stability, the understanding between the main economic forces. 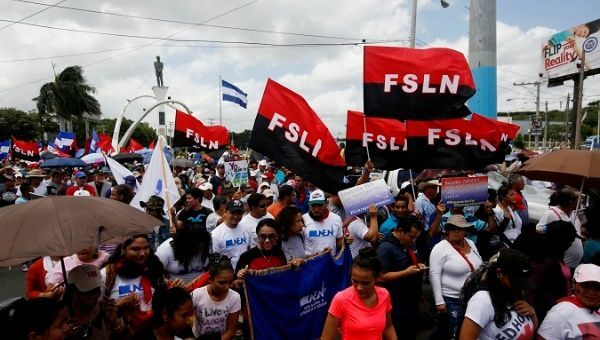 And suddenly things exploded because the extremist forces in the United States won’t accept that the FSLN is in power,” said Ortega. Ortega said that the climate in the country has been improving since mid-July when opposition-led roadblocks ended and the state was allowed to restart essential services and citizens were able to return to work. He also called for peace and dialogue as a way to overcome political crisis. “We have taken contact with the Secretary-General of the United Nations (Antonio Guterres), with different international organizations (as the EU) and logically with the Cardinal (Nicaraguan Leopoldo) Brenes,” Ortega said.